Ricoh has announced that its cameras will be developed and produced by Pentax, the company it bought last year in a £70m merger. The news won't come as surprise to many, as Pentax is the more historic brand and produces more cameras than Ricoh. The move makes sense to both parties as it means technology and resources can be shared. Writing on the company's website, Ricoh said, "In an effort to strengthen customer relationships and provide innovative products and services, Ricoh will re-organise its structure." The swap will be effective worldwide from April 1, 2012, and will give "PRI" (Pentax Ricoh Imaging) the function of digital cameras for the consumer market, which will include support for Ricoh branded cameras. Ricoh meanwhile, will continue to develop its security system business and imaging solutions for the business to business market. Speaking at the launch of the new Pentax K-01 camera last week, Jonathan Martin described to TechRadar how the merger was going. "At the moment we haven't seen too much influence at a local level, but the future looks positive with Ricoh as our parent company," he said. "From our point of view, it can only be a good thing [the merger] for our brand, and they want us to grow our business." 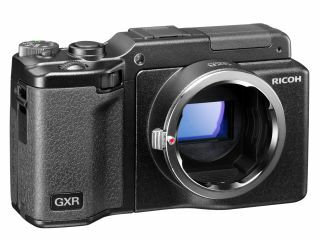 Ricoh cameras include the GXR, the world's first interchangeable unit camera. It is not yet known whether new Ricoh cameras from the group will be branded as Ricoh, Pentax or perhaps even Ricoh-Pentax.